"It's funny how ideas are, in a lot of ways they're just like seeds. Both of them start real, real small and then... woop, zoop, sloop... before you can say Jack Robinson, they've gone and grown a lot bigger than you ever thought they could." 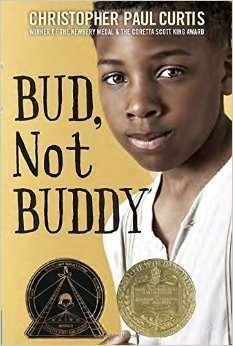 So figures scrappy 10-year-old philosopher Bud--"not Buddy"--Caldwell, an orphan on the run from abusive foster homes and Hoovervilles in 1930s Michigan. And the idea that's planted itself in his head is that Herman E. Calloway, standup-bass player for the Dusky Devastators of the Depression, is his father. Guided only by a flier for one of Calloway's shows--a small, blue poster that had mysteriously upset his mother shortly before she died--Bud sets off to track down his supposed dad, a man he's never laid eyes on. And, being 10, Bud-not-Buddy gets into all sorts of trouble along the way, barely escaping a monster-infested woodshed, stealing a vampire's car, and even getting tricked into "busting slob with a real live girl." Christopher Paul Curtis, author of The Watsons Go to Birmingham--1963, once again exhibits his skill for capturing the language and feel of an era and creates an authentic, touching, often hilarious voice in little Bud.